Still have questions after reading the Home Birth page? Then this page is for you. HOW DOES MY BABY GET A BIRTH CERTIFICATE AND SOCIAL SECURITY NUMBER? Once baby is born and you have chosen a name, the midwife will submit the information necessary for your baby to receive an official birth certificate and social security number. Your midwife will discuss the particulars with you before the birth. WHAT IF I NEED TO REACH THE MIDWIFE QUICKLY? Clients are provided with the midwife's personal cell phone number when care is begun. You are always encouraged to contact the midwife immediately for urgent concerns or labor. For routine concerns, please call during business hours or send an email. The study concluded that “Planned home birth for low risk women in North America using certified professional midwives was associated with lower rates of medical intervention but similar intrapartum and neonatal mortality to that of low risk hospital births in the United States. “ Women who birthed at home attended by a CPM experienced a higher rate of satisfaction and lower rates of interventions such as cesarean section and episiotomy. For more information about this study, visit http://mana.org/research-1. There are many studies that have produced similar statistics and some studies that have shown otherwise. It is important to be aware of whether unplanned home births, premature births, high-risk births, or planned unattended home births were included as these affect the outcomes and study results. DO YOU ATTEND WATER BIRTH? IS IT SAFE? You are welcome to labor or birth in water if you choose. Refer to this article for more information. There is some concern that pools filled and kept heated for days while waiting for labor to begin may result in bacteria growth. For this reason, we do not use that type of pool. If using an inflatable birthing pool, we strongly advise the use of a new disposable liner and new drinking water hose for each birth in order to reduce the risk of infection. If you plan to use your own bathtub, Whirlpool, or Jacuzzi, you will be provided with cleaning instructions at your home visit. HOW DO I PLAN FOR A HOME BIRTH? During your pregnancy, we address any concerns you have about giving birth and work together to keep you as healthy as possible. As your due date approaches we will complete an emergency care plan and you will set aside items such as receiving blankets, towels, etc. At your home visit, you will be provided with a birth kit. The supplies in your birth kit make it easier for us to contain any mess and clean up after the birth. I bring my equipment with me to your birth, including oxygen and medication to manage a postpartum hemorrhage. Within a short time after your baby is born, you will not even be able to tell that someone just gave birth in your home! WHEN DID YOUR PRACTICE OPEN? I began accepting clients in the fall of 2009 under the supervision of my preceptor/teacher and earned my certification in 2010. WHEN DOES PRENATAL CARE BEGIN? Many women contact me early and begin prenatal care at 10-12 weeks. Some women realize later in pregnancy that they desire to birth at home or they move to the area partway through their pregnancy. If you are further along in your pregnancy, please contact me as soon as possible to see if I have availability for your due date. HOW OFTEN ARE VISITS SCHEDULED? Prenatal visits are typically scheduled monthly until 28 weeks, every two weeks until 36 weeks, and then weekly until your baby is born. Postpartum visits are typically scheduled for 48-72 hours, 1 week, 3 weeks, and 6 weeks postpartum. Clients located more than one hour away from Bedford may be provided with an alternate home visit schedule. Consult the midwife and your paperwork for more information. WHAT DOES A TYPICAL PRENATAL VISIT INVOLVE? Each prenatal visit is scheduled for one hour to give you plenty of time to discuss any concerns and ask any questions you may have. At each visit we will check blood pressure, urine, and listen to your baby's heartbeat. As your pregnancy progresses, the midwife will measure your fundal height and check your baby's position with Leopold's Maneuvers. This means the midwife palpates (feels) your uterus to determine the position of your baby. DO YOU RECOMMEND HIRING A DOULA AND ATTENDING CHILDBIRTH CLASSES? If you are interested in a doula, I recommend hiring one who has home birth experience. 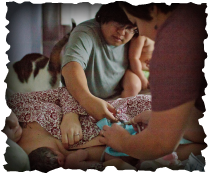 The advantage to having a doula at a home birth is that her sole purpose is to support you. Because our job calls for monitoring the safety of you and your baby during the birth, the birth assistant and midwife will not arrive until active labor is progressing and will take turns sleeping if your labor is long in order to be rested when your baby is born. A doula is an excellent addition to your team if you desire continuous emotional support from early labor to birth. If you are interested in childbirth education classes, I recommend attending a class taught by an independent childbirth educator. I am happy to refer you to local options. DO YOU ATTEND VBAC (VAGINAL BIRTH AFTER CESAREAN), BREECH, TWINS, ETC? Each mother's case is looked at individually: you are welcome to contact me to discuss your situation. WILL INSURANCE COVER MY BIRTH? Insurance coverage varies based on your individual policy; SLB Billing is available to run a Verification of Benefits for you and may be able to secure an in-network or 'gap' exception for you to improve your reimbursement. Some insurance policies do specifically exclude home birth, unfortunately. Medicaid/Hoosier Healthwise will not cover my services but will cover any visits with my collaborating physician. Many clients choose to pay using their Health Savings Account (HSA), Health Reimbursement Account (HRA) or Flex Spending Account (FSA). If you have further questions about insurance, please contact me. Payment plans and discounts are available for clients paying out of pocket. Barter for goods or services that are useful to the midwife may be an option, please contact me to discuss your options. WHAT IS INCLUDED IN THIS FEE? The out of pocket fee includes routine prenatal, labor & birth, and postpartum services provided by the midwife and assistant. Complementary care from other providers including back-up physician, chiropractor, massage therapist, or doula are not included. HOW LONG DO YOU STAY AFTER MY BABY IS BORN? The midwife and assistant typically stay for 2-3 hours after the birth: departing after the baby has nursed, the newborn exam (head-to-toe exam, weight, vitals, etc) has been performed, and mother has emptied her bladder while maintaining stable vitals. The midwife and her assistant are both trained in CPR and neonatal resuscitation. We carry the equipment necessary to manage resuscitation, hemorrhage, and other complications. Prior to the beginning of labor, we draw up an emergency care plan so that we know where the closest hospital to your home is located and how to reach them should the need to transport arise. WHAT IS YOUR TRANSPORT & CESAREAN RATE? About 6% of mothers will transport to the hospital in labor with an overall Cesarean rate of about 4%. The most common reason for transport is a long labor and a desire for pain relief. In these cases we drive to the hospital by private car. It is rare for transport to take place via ambulance. A transport to the hospital is a transfer of care to your back-up doctor/midwife or the doctor on-call at the hospital. The midwife remains with you whenever possible but is no longer your primary provider. Yes- I have been keeping statistics since the beginning of my practice and participate in the MANA Statistics Project. WHAT DO POSTPARTUM VISITS INVOLVE? The initial postpartum visit is usually held in your home between 24-48 hours postpartum. At this visit, the mother's blood pressure and bleeding are monitored, and the midwife verifies that mother is healing and adjusting well. The baby is assessed for jaundice and weight gain or loss. The Indiana Newborn Screening is performed unless you choose to sign a religious waiver or have it ordered by the pediatrician. The midwife also provides breastfeeding support for mother and baby. Subsequent postpartum visits for mom and baby are typically scheduled at the office at 1 week, 3 weeks, and 6 weeks postpartum, or as needed. If you have further questions and would like to schedule a consultation, contact us. Service area includes but may not be limited to the cities of Bedford, Mitchell, Springville, Bloomington, Martinsville, Owensburg, Orleans, Paoli, French Lick, Patoka, Jasper, Petersburg, Shoals, Huron, Williams, Loogootee, Washington, Montgomery, Vincennes, Huntingburg, Dale, Santa Claus, Ferdinand, Tell City, English, Marengo, Salem, Pekin, Scottsburg, Austin, Seymour, Medora, Brownstown, Columbus, Evansville in Indiana.